This article is about the event. For the book, see The Red Year. 4E 5 came to be known as the Red Year due to the fulfillment of the Nerevarine Prophecy and the disappearance of Vivec in the late Third Era. With the warrior-poet Tribune gone, there was nothing holding Baar Dau in place over Vivec City. An Ingenium powered by souls was created to hold the moon in place, which worked until the first few years of the Fourth Era, when a Dunmer named Sul destroyed the Ingenium in an attempt to save his lover. Finally freed of its stasis, the moon hit the city with the full strength of its original descent, triggering a series of natural disasters, notably the eruption of Red Mountain on the 3rd of Sun's Dawn, which devastated Vvardenfell and the province as a whole. Vivec City was annihilated; in its place nothing remained but scorched earth and the boiling waters now known as Scathing Bay. Ald'ruhn, Balmora, Gnisis, and Sadrith Mora, likewise, are no longer standing. Even Fort Frostmoth in southeastern Solstheim was wiped away. Places farther out in the mainland like Tear were similarly devastated by earthquakes and major flooding, and roads far to the south in Black Marsh were destroyed. 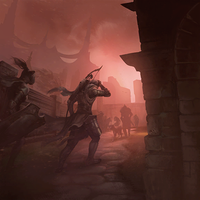 In the immediate aftermath, many "outlander" Dunmer returned home to help their people, despite the fact that it was almost impossible to breathe the air. Major relief efforts poured out of Mournhold, which survived the blast almost unscathed. The efforts were led by House Redoran and many settlements were rebuilt including Balmora in the following years. However, the Argonian armies of Black Marsh used the opportunity to take vengeance on the Dunmer, who had been enslaving Argonians for thousands of years, and pillaged southern Morrowind. For years afterward, Dunmer fled across Tamriel seeking refuge, with many relocating to Skyrim and the small island of Solstheim northwest of Vvardenfell. Although the Argonians eventually returned to Black Marsh and the Dunmer began the process of rebuilding Mournhold, Morrowind's capital was permanently moved to the Redoran stronghold of Blacklight far to the north. A previous eruption event, known as Sun's Death, took place in 1E 668 and roughly coincides with the beginning of the Nerevarine Prophecy.